Apricot sunstones and snowy white moonstones dance together in this inspirational necklace design. 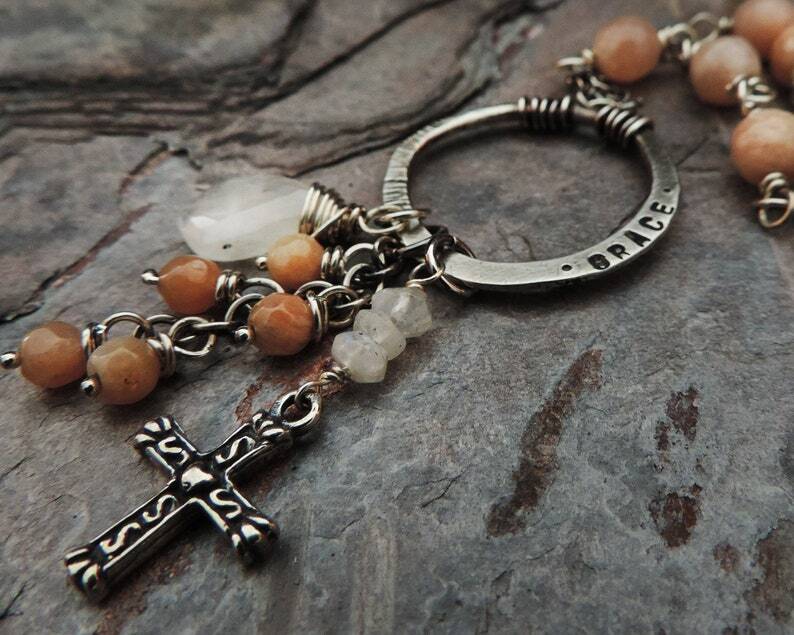 The organic textured charm circle stamped "GRACE" holds a trio of dangles highlighted by a small ornate patterned sterling silver cross charm accented with three tiny moonstone rondelles. A wire-wrapped moonstone teardrop and a tumbling of tiny sunstones complete the look. The pendant hangs from a sterling chain accented with more glistening sunstones in the length of your choice (24" shown). The organic charm ring measures 1" in diameter and the pendant hangs 2-1/8" from the chain.